Holmen STH 35 Traffic Study - TADI - Traffic Analysis & Design, INC. Holmen STH 35 Traffic Study - TADI - Traffic Analysis & Design, INC.
TADI's Role: To evaluate traffic impacts with initial and future development buildout of land uses and new roadways along STH 35 within the T.I.D. #2 area. TADI prepared a traffic study to evaluate the traffic impacts and recommended improvements along STH 35 for a residential and business park development. This is planned for construction within the next few years. The proposed development site lies within the Tax Incremental District (T.I.D.) #2 area (Seven Bridges), which covers about 970 acres in the vicinity of the USH 53/STH 35 interchange at the far north end of the Village. A series of new roadways are proposed throughout the T.I.D. 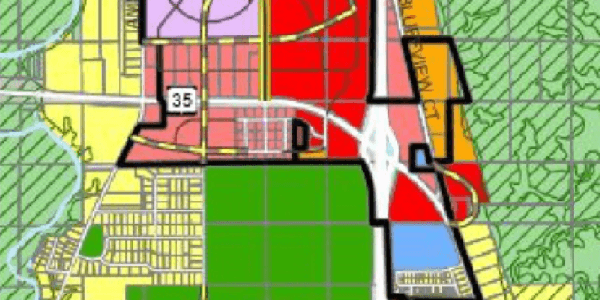 #2 area, which include two new roadway connections/extensions to STH 35. Using the future land use and access plan for the Seven Bridges area adopted in March 2016, TADI estimated the traffic volumes that could be generated by the year 2028. The traffic was assigned to existing and future intersections along STH 35, which were evaluated during the peak traffic hours to determine potential future geometrics, traffic control, and roadway cross-sections needed along STH 35. To satisfy WisDOT requirements for change in traffic control, Intersection Control Evaluation (ICE) studies were completed for three of the study intersections along STH 35.